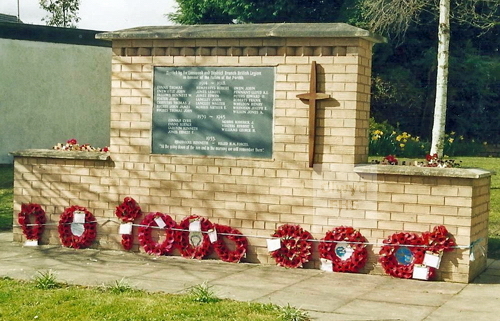 The Leeswood War Memorial commemorates those men of the Leeswood and Pontbleiddyn area who died in two world wars. The original memorial takes the form of an ornate Lych Gate to Christ Church Parish Church in Pontbleiddyn. However, a more recent memorial has been built in Leeswood, containing the same names. Leeswood (Welsh: Coed Llai) is a village and community in Flintshire. Pontbleiddyn is a village within the community of Leeswood. Between, 1974 and 1996, it was part of the county of Clwyd. Son of William & Jane Entwistle of Arosfa, Leeswood. Heestert Military Cemetery, Belgium. Son of Richard George & Margaret Evans of Pontbleiddyn. Erquinghem-Lys Churchyard Extension, France. (24th Denbighshire Yeomanry Bn.) 7 Sep 1918 24 Son of Bennet William& Elizabeth Fallows of Well House Farm, Pontbleiddyn. Ploegsteert Memorial, Belgium. Royal Welsh Fusiliers 27 Feb 1917 21 Son of Henry and Elizabeth Foster of Pontbleiddyn. Salonika (Lembet Road) Military Cemetery, Thessaloniki, Greece. Born Penyffordd. Son of John Griffiths, of 2, Church Row,Pontbleiddyn. Jerusalem Memorial, Israel. Of Ivy Cottage Queen Street, Leeswood. Helles Memorial, Turkey. (4th Bn.) 22 Feb 1917 49 Son of the late Capt. A. F. Jones, 4th Hussars, and Mrs. A. H. Jones. Served in the South African Campaign. Pontblyddyn (or Pont-Bleiddyn) (Christ Church) Churchyard, Flintshire. Born Leeswood. Husband of Elizabeth Jane Jones, Fern Lea, Queens Road, Craig y Don, Llandudno. (1911 Census). Also commemorated on the Llandudno War Memorial. Christ Church Churchyard, Pontbleiddyn. Nephew of William and Eleanor Whitley, 96 Hawarden Way Mancot Royal, Queensferry. (1911 Census) Thiepval Memorial, Somme, France. Born Leeswood. Resident of Normanton, Yorkshire, England. Pieta Military Cemetery, Malta. (2nd Bn.) 19 Apr 1918 28 Son of Thomas Langley; husband of Margaret Langley, of 1, New Row, Leeswood. Bouzincourt Rdge Cemetery, Albert, Somme, France. Born Denbigh. Son of Evan Griffith (schoolmaster) & Mary Hughes Morris, of "Laural House", Pontbleiddyn. Resident of West Ham, London, England. Basra Memorial, Iraq. 13 May 1915 36 Son of Naomi Owen, of The Rectory, Eryrys, & the late Rev. Richard Owen; husband of Margaret May Owen, of 16, Fair View Place, Dingle, Liverpool, England. Plymouth Naval Memorial, Devon, England. (HMS President) 15 Sep 1916 53 Born Bangor, Caernarfonshire. Husband of Mabel R Lloyd, of Pentre Hobyn, Leeswood. Also commemorated on the Mold War Memorial. Christ Church Churchyard, Pontbleiddyn. King's Royal Rifle Corp 31 Aug 1918 19 Son of William & Eveline Peters, of Queen Street, Leeswood. Niederzweren Cemetery, Hessen, Germany. (9th Bn.) 4 Oct 1918 20 Son of Meshach & Mary Roberts, of Queen Street, Leeswood. Perreuse Chateau Franco British National Cemetery, Seine-et-Marne, France. (618th M.T. Coy.) 26 Nov 1916 26 Son of George Henry & Mary Ellen ("Nellie") Wheldon, of 5, Albert Street, Leeswood. Dar es Salaam War Cemetery, Tanzania. (2nd Bn.) 9 Jul 1916 20 Son of Stephen Edward & Ruth Whenham of The Lodge, Pentrehobyn, Leeswood. Couin British Cemetery, Pas de Calais, France. (100 Sqdn.) 26 Jun 1943 22 Son of Thomas & Hilda Connah, of Pontbleiddyn. Runnymede Memorial, Surrey, England. (4th Bn.) 1 Mar 1945 26 Son of Samuel George & Mary Louisa Evans, of Leeswood. Reichswald Forest War Cemetery, Nordrhein-Westfalen, Germany. (HMS Glorious) 8 Jun 1940 14 Son of Mrs. C Garston, of Leeswood. Sunk by Gneisenau and Scharnhorst. Plymouth Naval Memorial, Devon, England. (53 Sqdn.) 4 Feb 1942 21 Son of Allen & Mary Jones, of Pontbleiddyn. Kranji War Memorial, Singapore. Son of Evan Griffith and Mary Hughes Morris, Laurel House, Pontblyddyn, Mold (1911 Census). Husband of Irene Morris. Son of Frederick William & Clara Alice Veater, of Ashford, Middlesex, England. Ashford Burial Ground, Middlesex, England. 964465 Royal Air Force Volunteer Reserve 30 Nov 1944 26 Son of Thomas Harold & Clara Alice Williams; husband of Joyce Mable Williams, of Penyffordd. Christ Church Churchyard, Pontbleiddyn.